With holidays coming to an end, getting the family back into a school routine is often the last thing parents want to face. Although sending the kids off to classes can mean some well-deserved peace, the world of packed lunches, homework, after school activities and uniforms can seem overwhelming. From lunchbox ideas to essential organisation tricks, Obela's Expert Mum, Chantelle Ellem of Fat Mum Slim, knows a thing or two about the back to school bustle. As one of Australia's favourite parenting bloggers, she shares her tips to get kids and parents ready for the school start and ensure the transition is smooth. Obela, Australia's number 1 hommus dip, has created a range of portable Hommus packs aimed at helping Australian's sidestep a sweet treat during the day. Obela's Hommus to Go and Hommus Singles ranges provide Mum's with a better-for-you snack alternative to help fuel their kids during the day – which also tastes delicious. Chantelle Ellem of Fat Must Slim comments, 'As a mum, I know that getting the kids back to school after the holidays can be a whirlwind mixture of stress and liberation! Finding ways to ease both you and the kids back into the school routine will make a world of difference for the busy term ahead. From fun lunch box ideas to time savings tricks I'm excited to share my tips for back to school survival! 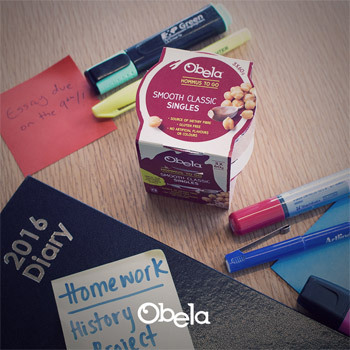 'My kids can't get enough of Obela's Hommus To Go for a healthy snack at recess or lunch, or maybe even as an after school snack. It's the perfect size to pop in the kids' lunch box and it's big on flavour too – they love it!" This simple tip will change your life. It always feels easiest to leave everything until another day, but by rushing around at night and getting things ready for the following day, you'll thank yourself. Prepare lunches, get uniforms ready and line the school bags up and ready for the next day. Wouldn't it be awesome to have a lunchbox return home empty? Give your kids foods you know they love, and will gobble up in an instant, but also add in new foods, and a little creativity too. Adding in a little note, or picture, or using cutters to cut food will make them a little more excited and hopefully adventurous. My favourite is Obela Hommus To Go. These delicious ready-to-go snacks take the stress out of packing lunch. Crisp crackers, and scrumptious hommus that you can simply toss into their lunch box along with other foods, and they're good to go. Taking kids from holiday-mode to school-mode can be a hard task, especially when school holidays have been a blast. Make mornings fun by creating challenges; have the kids get dressed fast before a song finishes. Take a little time over the weekend to prep for the week ahead. Make and bake scrolls, sausage rolls, and any other baked goods your kids love. Cut up carrot, celery and cucumber sticks and serve with Obela's convenient Smooth Classic Hommus singles packs. Make life easier by getting your prep on! School holidays are done, and you might feel like doing a freedom dance after school drop off. 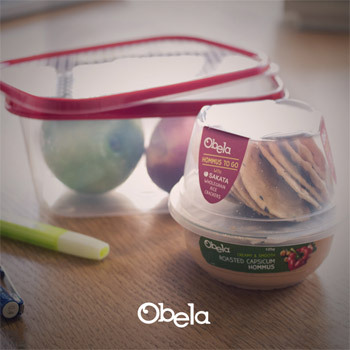 Sit back, pour a cup of tea and snack on your own Obela Hommus To Go pack too. Normal life has returned!